Create a rotating list of children to light altar candles in worship. Have children commit to same Sunday of the month or for several weeks in a row, either alone or in pairs with a classmate or sibling. This part of worship brings in family to witness a special moment and develops a child's sense of sacred space and church ritual. Often Acolyte children will wear choir robes which will transform a child's presence. It allows them to be serious and automatically gives them an identity that is important and holy. It also allows the parents and congregation to focus on the candle lighting and not on what the child is wearing. Many churches have a variety of children's choirs: cherub for preschool / K, multi-age, youth choir for teens. Having children’s choirs is a great experience for children to be present in worship and to give the “Gift of Song” to God and the congregation. Creative ways to have rehearsal: Have during coffee hour or even during class time with teachers playing a prepared CD of the song. Schedule to sing once a month in worship or every other month. Even if it is “Jesus Loves me” with a few children...it is a magical moment for parents to hear and the congregation will love it! Parents & children are more intentional with attendance when children's choirs are planned in worship...and relatives come to see the children sing too! Bell Choir & Chimes *Offering a Bell Choir or Chimes for children will require specific leadership but it is a great opportunity to have children in worship. These opportunities are unique to being part of a church family and sometimes they are intergenerational moments that strengthen relationships between the ages. What a great experience it can be to accomplish the “Gift of Music” through the amazing ring tones of bells or chimes. 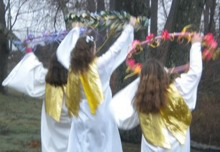 Sacred Dance & Sacred Processionals are a great opportunity to have children in worship. It can incorporate many ages and no prior experience is necessary. It is “A Prayer To God with our body” and can really deepen a child's spirituality. Other celebrations & props: World Wide Communion with prop: globe and costumes from many countries. Baptism with prop: wooden cut-out white dove. 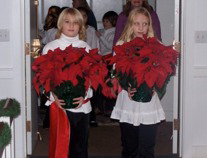 Have children be a part of a Holiday Ceremony to decorate the church for the Christmas season. Use a variety of ages or designate one grade level (5th grade) so children look forward to being a part of this “rite of passage” as they approach that grade level. Children wear a basic white top and black bottoms and wear red sashes. Children carry down items: Christ Candle, Advent wreath, poinsettias, Christmas rose, ivy & greens, a creche, and then light the Christmas tree.